Shearling boots. Draped ponchos. Shoulder pads. Turbans. Jumpsuits. These items are all glamorous, fashionable, and desirable - to women. But do they literally send men running in the opposite direction? Maybe, but Leandra Medine doesn't care. A born and bred Upper East Sider, Medine's fashion epiphany occurred while mourning multiple broken relationships in the dressing room of uber-trendy Topshop in Soho. As she slipped into drop-crotch shorts and a boxed sequin blazer, it hit her: she didn't have a boyfriend because of the way she dressed. The more she thought about it, she realized that such outfits, such items of clothing, could measure her whole life. These essays, written with the author's signature sass and blunt honesty, explore the deep connection between our memories and the sartorial choices associated with them. From The Bermuda Shorts to The Magical Harem Pants, Medine relates with wit how she navigated her way into the most unusual item of all: The Inconsequential Big White Dress (And Organza Jacket). 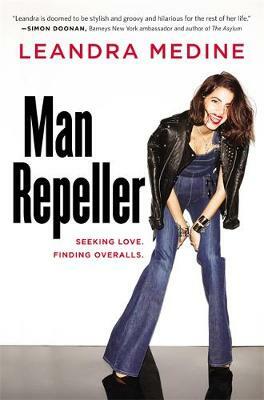 That's right, even the MAN REPELLER found love. This book is a collection of awkwardly funny experiences, a sweet love story and, above all, a reminder to celebrate and embrace a world made for women, by women.